In November, a few of my Facebook followers encouraged me to turn a picture into an entire post. So here goes! Each of my kids gets an allowance. And here's how it works for us. -We "pay" them at the beginning of every month. (We tried weekly and failed to remember, if you want to know the truth. So paying monthly works well for us). We pay in $1 bills. Each child gets $8 for spending, $8 for savings, and $4 for "Jesus money." -Each child has two clear jars: one for savings (which goes to the bank when it's full enough) and one deemed "Jesus money." The spending money goes immediately into their purses which stay in the car for shopping trips. The clear jars are nice, as the kids can see them fill up. -Their spending money can be spent as they choose. One of my daughters loves to buy herself special snacks (think a cake pop at Starbucks). Another one of my girls obsessively buys art supplies. One child is a saver. The other is a spender. Our son (5) just recently started receiving allowance like his big sisters, and he's enjoying the process! -There's no breakdowns at stores, asking for us to buy them things. It always goes back to one question: "Do you have your allowance?" This teaches personal responsibility, delayed gratification, and money management. -Allowance isn't earned by doing chores. It is expected that our kids pitch in when asked, with a good attitude, because they are part of the family. Now I get that in the "real world," you're paid to work...but we aren't too worried about that right now. However, the kids can earn extra money (not allowance) occasionally by doing something above and beyond that we need help with. For example, one day my oldest, who likes to organize and sort, cleaned out our "junk drawer." It took her close to an hour and she enjoyed earning a few bucks! Another day, she helped me clean out two pantries. -Birthday money goes into savings, while gift cards can be spent. Our reasoning for this? Our kids have four grandparents, six aunts and uncles, and many cousins: they get many, many birthday gifts. So any money given to them should be saved, not spent on MORE "stuff." Since this has always been our rule, it's really no big deal. The kids know what to expect. However, if they're given a gift card, they are allowed to spend it as they wish. -The savings money is not for a "rainy day." It will be to help pay for a bigger purchase (like a car) or college fees. -Now, on to the "Jesus money." As a family of faith, we believe in tithing. However, we believe that the child should be able to see the "fruits of their labor," meaning, not just hand over their cash into a collection plate being passed around (unless they feel so inclined, like when my oldest chose to give some money for hurricane relief), but rather a more active act of faith. 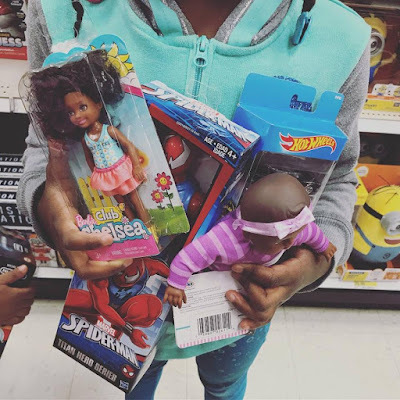 Each November or December, my kids buy gifts from an angel tree choosing OR we buy gifts for a birthday child through our local foster care organization. Our kids LOVE going to the store, choosing the gifts, and paying for them---yes, in $1 bills! (God bless the Target cashiers!) 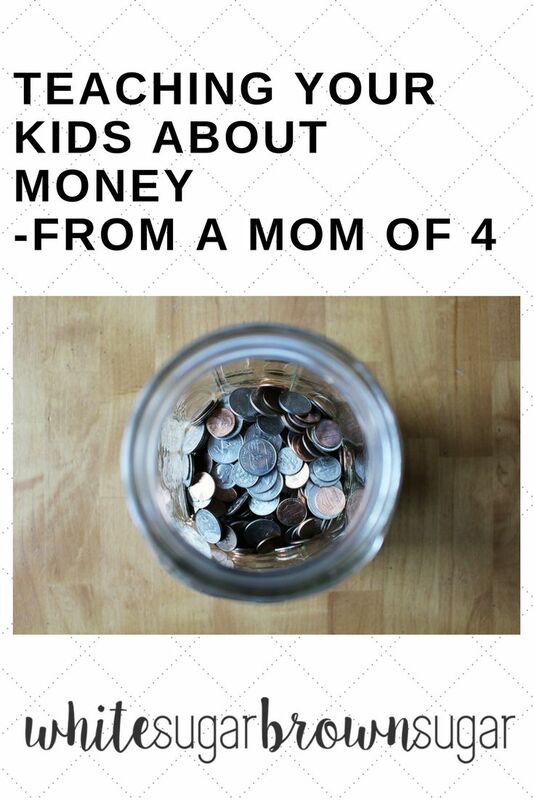 During this activity, they have to think what others may want to receive, keep track of how much money they can spend (lots of math), and practice making decisions. 1: Don't overthink it. Just give it a whirl and see how it goes. Stop delaying it because you fear you'll mess up. Let your kids know that you're trying out something new, and they should expect that you'll be adjusting and adapting as need be until you find your groove. 2: Make changes as you go along, just like we did. Remember I told you that we forgot to give our kids a weekly allowance? So we went to monthly. Easy! 3: Guide, but let mistakes happen. 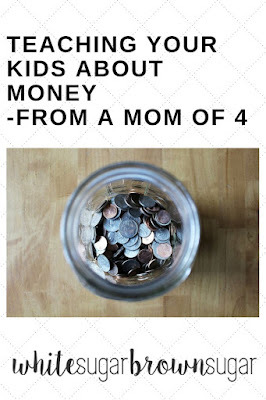 For example, I help my kids count out their money at the checkout and offer reminders like "hang on to your receipt," say "thank you" to the cashier, and put the change you're given back into your purse, zipping it shut. BUT, I remember one time my daughter took a $4.99 item up to the cash register. She only had $5 and hadn't accounted for sales tax. She looked at me, and I reminded her that if she didn't have enough money, she'd have to wait. Yes, I could have just handed her the change to finish paying for the item, but instead I stood firm in allowing her to "live and learn." She handled it really well! She told the cashier, "I don't have enough money to buy this today" and handed the item to her. 4: Have designated money spaces. For us, it's the jars and the purses. Do whatever works for you, but just establish some sort of space. This helps your child stay organized. 6: Keep it simple. The reason I think adults get so overwhelmed with money management is because of how complicated we make it. Teach your kids really simple money management lessons through the gift of a allowance: it provides opportunities for real life money management experience. What works for you and your family? Are you fans of allowance? Do your children do chores to earn money, or is allowance given no matter what?